Update: 10-14 23:59hrs - One fatality - Authorities say a 98-year-old man who was evacuated from the wildfire has died. Santa Barbara County Sheriff-Coroner Bill Brown says the unidentified man had multiple medical problems and it's unclear if his death was directly related to the fire.The man was evacuated to a hotel, but it wasn't immediately clear where he died. Update: 10-14 19:00hrs - Officially 111 residences have been destroyed, and 9 have been damaged. Update: 10-14 17:00hrs - As of about 1:35 p.m., according to The Indy's Ethan Stewart, most houses from the 600 to 1000 block of Coyote Road are completely burned. Although 820, 870, and 890 Coyote Road are standing (but heavily damaged), 840 and 880 are completely burned. At 840 Coyote Road — where Bill Joyce and his wife, Nicole, live in a rented home from the Harlin family — the fireplace, chimney, and water heater are all that's left from the house. Stewart described the scene as "probably the worst possible scenario," saying "there's flat ground where houses used to be." Fire, police, and gas company personnel are at the scene, and some homeowners, but not many, are along Coyote trying to figure out what to do next. Planes are doing water drops over Coyote Road; very small fires — more accurately described as tiny hotspots — are springing up. Stewart also reported that there's significant damage along East Mountain Drive; just about every other house along that road is burned down to its foundation. Stewart said he had to turn around at about the 300 block, where fire crews were dealing with hotspots there. Ben Ciccati, a graphic designer with The Independent, just reported that his house at 320 East Mountain Drive was burned to the ground. He and his family, wife Michelle and daughter Chloe Bee, evacuated early Thursday evening; Ciccati returned to the house at 11 a.m. this morning to check on its status and said it was completely burned. Update: 10-14 17:00hrs - One fatality due to fire now being reported, Major Losses for Westmont Faculty Housing. 15 faculty families — and one retired professor — have lost their homes. Westmont Colege lost nine structures: four of the 17 buildings that make up Clark Halls (F, G, M and S), Bauder Hall, the physics building, the old math building and two Quonset huts. The latter three buildings were scheduled for demolition in the coming weeks to make way for new facilities on campus. While Westmont has lost trees and landscaped areas, the formal gardens below Kerrwood Hall were spared, as was the grove of Italian stone pines below the dining commons. Beginning early Friday morning when the direct threat had lessened, students were taken off campus. Many churches and local residents have generously opened their homes to both students and faculty. "We're so grateful for the many offers of assistance that have poured in since the fire began," Beebe says. "It's so encouraging to receive that kind of support from the community." 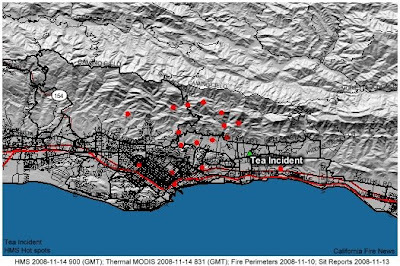 One Westmont alumna, Lesley Miller, has set up a Facebook group, Westmont College Prayer and Support for Tea Fire, which already has 318 members. All students have found temporary housing, but about 40-50 lost their rooms and will need to make longer-term arrangements. Anyone willing to house a student for the rest of the fall semester and possibly during the spring can contact westmonthousinghelp@gmail.com. 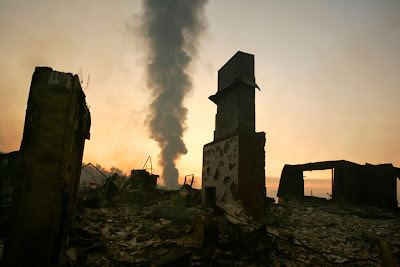 Update: 10-14 13:00hrs - According to Access Hollywood, actor Christopher Lloyd's home burned last night in the Tea Fire. Update: 10-14 12:00hrs -The Villa Riviera senior home, which is near the former St. Francis Hospital, has been evacuated and the 16 people who are reside there are staying at Cottage Hospital. Though Cottage Hospital has cautioned people to stay away from the hospital unless they are injured, they also want people not to hesitate to come if they truly do need medical attention. Update: 10-14 11:00hrs - 2000+ acres have burned, Over 100 homes have burned, 13 civilian injuries at least 5 burn injuries, 5 firefighter injuries- smoke inhalation and burns, 5400 residents evacuated, No containment. Student and faculty housing units at Westmont College were destroyed. No students were injured. Students sheltered in place overnight in the college gym. Those wishing to extend temporary housing to those displaced by the fire should send their name, phone contact information, e-mail address, house address, and the number of individuals they can accommodate to: westmonthousinghelp@gmail.com. Montecito is a census-designated place (CDP) in Santa Barbara County, California. A CDP is an unincorporated community that is, for statistical reasons, designated as a community by the Census Bureau. Administrative Unit: CALFIRE, Montecito City Fire, Santa Barbara City Fire and Santa Barbara County Fire. Structures Threatened: 1,500 residences currently threatened. Structures Destroyed: 111 residences have been destroyed, and 9 have been damaged. Mandatory evacuations in Montecito, Santa Barbara City and areas within Santa Barbara County. 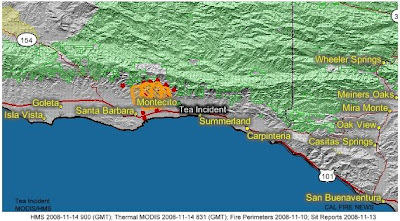 For more specific information on evacuation please visit theSanta Barbara County Office of Emergency Serviceswebsite. Extreme fire behavior continuing to push fire on to the community. A Red Flag Alert remains in effect in Santa Barbara County. Portion of the communities of Montecito and Santa Barbara City remain without power due to downed power distribution and transmition lines. CAL FIRE Incident Command Team #10 has transitioned into a unified command at 6:00 p.m. today. An early warning notification system has helped to evacuate 4500 residents and communicated a voluntary evacuation of an additional 4500 residents. 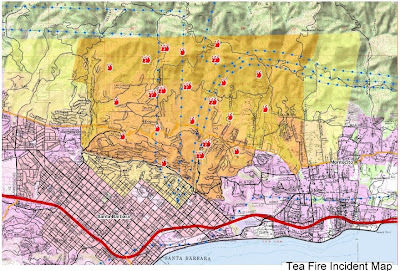 Evacuations and road closures remain in effect for the west portion of Montecito and portions of Santa Barbara City.